New Orleans, 1853. James McGuigan arrives in the port city and succumbs to yellow fever. A patient in the final stages of yellow fever, observed at Cadiz, Spain in 1819. On 27 May 1853, 26-year-old James McGuigan admitted himself to the Charity Hospital in New Orleans saying he had felt sick for four days. Within hours he became delirious and, early next morning, he threw up black vomit, a symptom familiar to anyone who had lived through New Orleans’s regular yellow fever outbreaks. By 6am McGuigan was dead, the first fatality in the worst epidemic any American city had ever experienced. McGuigan, an Irishman, was a stranger to New Orleans. He had arrived in America’s fifth-largest city just 17 days before, aboard a ship carrying 314 Irish immigrants from the British port of Liverpool. Two days later a sailor from another newly arrived ship, the Augusta, transporting passengers from Britain, Germany and other European countries, died in the same hospital. At the autopsy, local physician Dr Erasmus Darwin Fenner observed the yellow colour of the sailor’s skin. Black vomit was found in his stomach. These apparent cases of yellow fever, though occurring unusually early in the year, prompted Fenner to launch a “scrutinizing investigation”. The doctor’s inquiries revealed that the Augusta had travelled up the Mississippi river together with a ship from Kingston, Jamaica, where yellow fever was rife. What’s more, Fenner discovered that “free communication” had taken place between the two vessels and that the Augusta ended up mooring “not more than a hundred yards” from McGuigan’s ship. Fenner’s focus on the ships that carried these two men to New Orleans was not unusual. At the time of their deaths, no one understood how yellow fever spread or knew, for sure, whether it was contagious. Among other scapegoats, the disease was blamed on ships, distant countries and poor sanitation. Immigrants like McGuigan were also blamed for bringing the disease on themselves – and contributing to its spread through cities – because of their supposedly immoderate lifestyles. In early July, as the annual influx of mosquitoes swamped the city, one local newspaper described New Orleans as looking and smelling “epidemical”. Some residents responded by fleeing, but many remained calm. 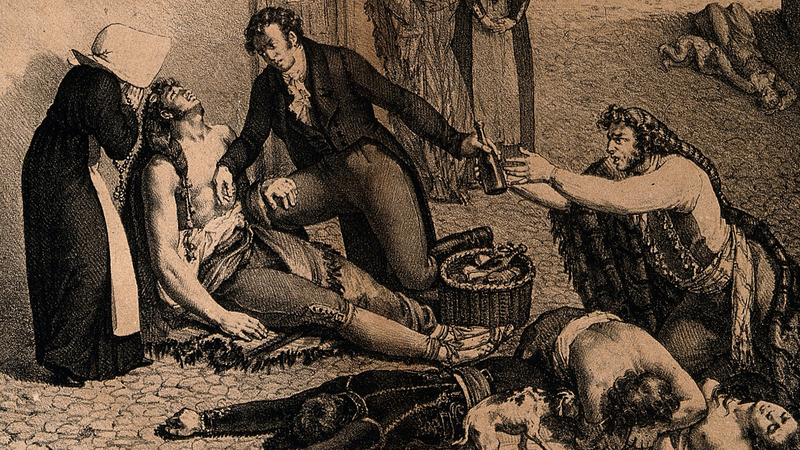 Yellow fever, after all, was known as the strangers’ disease. Ever since the earliest city epidemics in the late 1700s, everyone had known foreigners and travellers from other parts of America were much more susceptible than those born in New Orleans. Yellow fever deaths in New Orleans by place of birth, 1 May to 31 October 1853. Proportion of yellow fever deaths in New Orleans by place of birth, 1 May to 31 October 1853. Accepted medical wisdom ranked newcomers to the city as those most at risk because they had not yet become used to the subtropical climate that was so very different from their own. Locals, on the other hand, were thought to adjust, or acclimate, gradually over time. The idea of ‘acclimating’ (or not) fitted with both official and unofficial records of death rates. A businessman writing about an earlier epidemic that occurred in 1847 attributed nine-tenths of all funerals within a fortnight to Irish victims; six years later, immigrants accounted for 90 per cent of recorded yellow fever deaths, despite making up less than half the city’s population. In general, Irish and German immigrants appeared most likely to die from the disease. The 1853 death rates for both groups were reported to be 20 times higher than that for native New Orleanians. The ‘stranger’ factor was even recognised by the Mutual Benefit Life and Fire Insurance Company of Louisiana, which charged high premiums to Americans travelling to New Orleans during the summer months on the basis that these visitors were not acclimated to the area. However, acclimation wasn’t the only factor thought to lead to high death rates in some marginalised groups. Most newspapers, physicians and the public associated the origin and spread of yellow fever with the lowest levels of society and the “miserable, filthy, loathsome manner” in which these communities were thought to live. More judgmentally, the local shipping clerk who penned that phrase also positioned those who appeared most susceptible to the disease as “a set of rumdrinking, fighting people”, clearly something ‘other’ than his own kind. Medical opinion followed a similar line, with the editor of the New Orleans Medical and Surgical Journal suggesting that the prevalence of yellow fever could be reduced by raising both the social and moral conditions of the labouring classes. Local physician Dr J S McFarlane felt visitors to the city could exempt themselves from infection by remaining sober and living an “orderly” life, a habit that might be difficult for those immigrants forced to sleep a dozen to a small single room. The “fatal epidemic” of yellow fever in New Orleans from The History of Yellow Fever in New Orleans, 1854. Some people viewed yellow fever epidemics as a blessing that kept the number of these undesirable immigrants in the population down. Even overlooking this extreme view, the categorisation of yellow fever as a disease of the lower classes, which left respectable residents either uninfected or only mildly ill, meant tackling the issue was hardly a priority for health officials, who themselves blamed poor sanitary conditions. In the absence of scientific explanations about how diseases spread, medical theories often reflect the social attitudes and prejudices of the time. At the time of the 1853 epidemic, social attitudes in New Orleans were inevitably influenced by the daily arrival of hundreds of immigrants, who ended up living in cramped conditions in the poorest parts of town. Only 20 years before, the US Census recorded just 46,000 residents in New Orleans. During the intervening period, as the Mississippi river trade boomed, the population grew rapidly. Americans from the northern states moved south to take jobs as clerks, doctors and lawyers. Irish immigrants like McGuigan, fleeing the potato famine of the late 1840s, and Europeans from countries undergoing revolutions took jobs as labourers. By 1852 the city census measured the population as 145,000. The devastating impact of a yellow fever epidemic in Barcelona, 1821. Two months after newcomer McGuigan had walked into the Charity Hospital, yellow fever was decimating New Orleans. In late July patients were forced to lie on the hospital’s floors as it took in 100 new cases a day. The mortuary “teemed with frightful corpses” and local graveyards struggled to cope with demand. Since residents who had stayed in the city were spending their time tending to the sick, trade came to a standstill. All this chaos was, we now know, ultimately down to the Aedes aegypti mosquito. If the insect draws blood from a yellow fever victim, it can transmit the viral disease, 10 or 12 days later, to anyone else it bites. These mosquitoes breed in urban areas and live within a relatively constrained area. Cities, and more specifically closely packed housing and cramped rooms – like those where new immigrants to New Orleans lodged – therefore become breeding grounds for both these mosquitoes and the disease they transmit. A mosquito, Aedes aegypti, painted by Sir Philip Manson-Bahr. Once bitten by a yellow-fever-carrying mosquito, newcomers were less likely to be able to deal with the infection than locals, since they lacked any immunity from previous exposure to the disease. Rather than gradually acclimating, locals and strangers alike developed immunity as they lived through yellow fever outbreaks. One of the reasons the 1853 epidemic’s death toll was so high was because New Orleans had not experienced a major outbreak for several years, so few of the 100,000 recent arrivals had built up immunity, unlike the ‘strangers’ who had lived there long enough to be involved in previous incidents. By the time the epidemic subsided in October 1853, a tenth of the city’s population had been buried and a further 40 per cent had suffered with the disease. Just over a century later, writer Susan Sontag described illness as “the night-side of life”, a place we all, at some point in our lives, are forced to “emigrate” to. In New Orleans half the population were forced to emigrate there, many of these being immigrants who were already viewed as something ‘other’ than the local norm. Of course, yellow fever isn’t the only disease to be linked with a marginalised group. Many infectious diseases have been described as conditions from other places or have been blamed on specific demographics. Groups of people classified by race, class or sexuality have all carried – at some time or other – the stigma of diseases, such as leprosy, cholera, syphilis and AIDS. We don’t know if young James McGuigan was a “rumdrinking, fighting” man or not, but some people felt he and his fellow countrymen were more susceptible to infection because of such behaviour, and acted accordingly. In fact, McGuigan’s final jaundiced hours, spent haemorrhaging uncontrollably and regurgitating blood, were simply down to a bite from a mosquito carrying a disease he had not previously encountered. A Chinese woman suffering from leprosy. In the 1880s, the president of the Louisiana State Board of Health blamed the “filthy, vicious, debased… Chinese” for the disease. Syphilis has been blamed on a range of different nationalities and religions, including the French. Poster warning of the “alarming approach” of what was described as “Indian” cholera, produced in London in 1831. Tuberculosis is often described as a disease of “the poor”. This 1951 poster by the Swiss Association Against Tuberculosis appealed for funds to “Help us to help the poor”.